Sometime at the end of December 2012, I enrolled in my brother’s journey to Kerala by car. I booked my return tickets from Thrissur. In fact, I made as much as 5 bookings for different dates in January 2013 – January is all set to be a happening, travel filled month for sure. I’ve never travel by G4 from Thrissur to Bangalore, and hence booking a ticket by them was a no-brainer decision. About a week before my proposed journey to Kerala, my boss in office dropped a spanner into my plans – we have a statutory body inspection at our college that day – there is no way I can even think of taking a leave on that day. Reluctantly, I told my brother to go ahead and with a heavy heart told him that I wouldn’t be coming to Kerala. I last went home in mid-November – almost two months ago. I did not cancel my return ticket banking on a feeble hope that I would be able to head home – provided the inspection gets over on Saturday by evening. It was one busy day – the inspectors kept us on the toe and we were under a lot of pressure during the day. Afternoon got even busier since a lot of paperwork was to be done. All the work got over around 1500hrs, and all the staff headed out to watch the finals of our college’s cricket tournament – it was one scintillating match. Students of my class were part of one of the cup contenders – they had to make 102 runs from 16 overs – they made it to that figure in around 11 overs with the loss of 6 wickets. After the presentation ceremony the principal declared that the inspection was over and Sunday was a holiday – yay! I headed home in joy. Called up home and informed that I’d be home the next morning. For some reason, I did not check tickets while at office or block any tickets. Reached home around 1815hrs and immediately checked for tickets. I initially thought of taking SPS – since that is the only operator on the “to-be-tried” list of operators to Kerala. But, SPS would drop me at Mannuthy (Thrissur bypass) only – and, it also departs early. Without much thoughts, I called up Friends Travels and asked for my contact – he delightfully blocked a seat for me, and asked me to reach there by 2145hrs. A quick round of cooking, and my dinner was ready. I finished my dinner and walked out of home at 2035hrs. It is quite difficult to get an auto at that time – plus chances of a traffic block – I did not want to take any chances. Reached the Auto stand at around 2045 and found one standing there – he asked for Rs. 180 for the 8km journey – after some haggling and some “walking away” dramas, we both settled for Rs. 150 – too much for the distance. I was dropped at Madiwala at 2105hrs – still about an hour to go for my bus. I walked into Friends’ travels and saw our Rajeevettan sitting there – talked to him for a while and then got my ticket after paying the ticket amount. I was allotted seat #4 – the first row left side window seat – I am not a fan of the first row, especially for night journeys. The bus for my trip was already standing there, but boarding hadn’t started. Pathanapuram multi left soon after I reached – Trivandrum (via Marthandam) was taking in passengers now. Boarding for my bus started after the Trivandrum bus left. My bus, KA-01-AB-5737, was standing there shining and all set for the journey to Kottayam, via Ottapalam, Thrissur, Ernakulam, Vaikom. The drivers and the attendant were standing near the bus – a guy from Friends had just come in for ticketing checking too. I told him that I would be standing outside till departure – he marked me “present” on the chart. Rajeevettan was there till the bus departed. My seat was changed to somewhere in the middle (I hate being on the first row for a night journey) – and got two seats all for myself. My bus: KA-01-AB-5737. This photo was taken when the bus was being brought from the Factory after delivery. The bus started moving at 2205hrs. They asked the crew to take a U turn and park on the opposite side, since one passenger was yet to turn up. The bus went to St. Johns signal, took a U-turn and came back – we stopped opposite to Friends Travels. By then the passenger had turned up and was standing there – we picked up the passenger and finally started moving at 2210hrs. They switched on a movie and the curtains were adjusted. That was fairly recent slapstick comedy movie – I wanted to see this movie, but I was horribly tired and sleepy. There was absolutely no traffic at the Attibelle toll gate or at the Zuzuwadi check post (very surprising for a Saturday) – we reached Hosur at 2242hrs (one passenger got in). The driver meant business and he was maintaining fairly good speeds most of the time, with a couple of hard braking thrown in. I was awake till we crossed Krishnagiri. I remember watching the start of the second disc, but fell asleep sometime later. I woke up suddenly and saw that the movie was still running but the bus had stopped outside a bakery. I watched the climax of the movie (now the bus was running) and saw the end-titles rolling. I slept off again and woke up after sometime only to see that the movie was over but the TV was still on. I was sitting right below the rear LCD screen – so just closed the screen and continued sleeping. I had one really deep sleep after Krishnagiri – noticed sometime early in the morning that the bus was stationary – did not notice the time or place. I woke up as the cleaner shouted out “Palakkad” and switched on the lights – the time was 0456, and we were standing outside Palakkad fort. The halt was brief – we got moving quickly. Made another stop outside the KSRTC bus station, and then continued. There was one drop at Ottapalam, but I did not wake up at the time. I woke up just as the bus ran through a rough patch near Wadakkanchery railway over bridge. I slept off again, and woke up just as we passed Kolazhy. Slept again – this time it was deep enough that I did not even realise that we reached Thrissur. I woke up and struggled to open my eyes – the bus was about to stop and the surroundings seemed very similar to me – we were already outside the General Hospital (the Thrissur town drop point) in Thrissur! I literally jumped off my seat and gathered by baggage. The entire bus was sleeping – nobody seemed to be getting down here – that was not the case. The cleaner too was a bit surprised to see no body coming – he switched on the lights and shouted out “Thrissur” – there was commotion in the bus, with many people jumping off their seats, some searching for their footwear, others searching for their baggage. I got off the bus at 0620hrs, and took an auto to Sakthan stand, from where I got a KSRTC bus to head home. End remarks: The bus was KA-01-AB-5737, and had about 88k kms on the odo. The maintenance was good. This bus was initially run on the Bangalore-Trivandrum route, and then shifted to this route – I was present for the delivery of this bus. There isn’t much to write about the bus or the crew – both were good. The first driver was a bit rash, while the second driver was too good. I slept well throughout the journey – did not feel any rash driving or hard braking after Krishnagiri. The end-to-end running time was 8h15m – its perfect timings for a Bangalore-Thrissur bus, but it on the higher side for a Bangalore-Kottayam bus. I think it would be appropriate to reschedule the bus as Bangalore-Ernakulam, instead of taking it all the way to Kottayam. 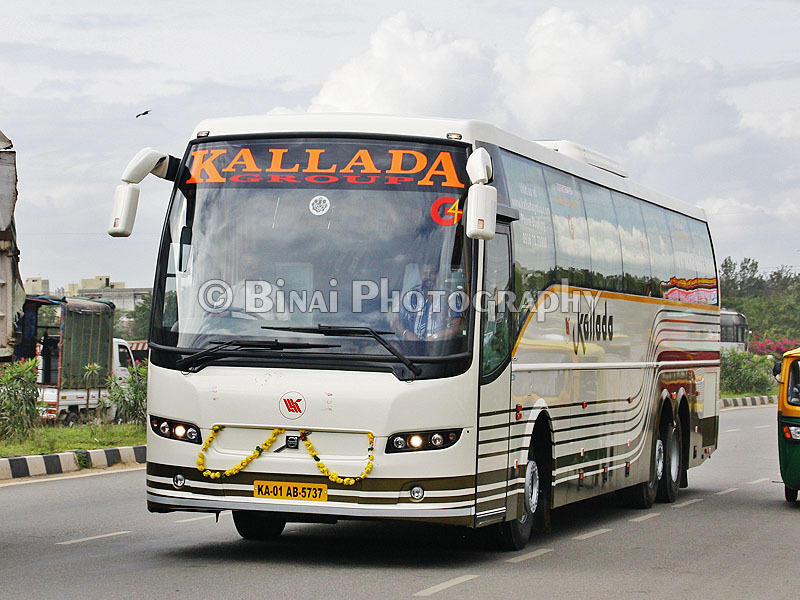 Kallada G4 seems to be going down on their standards – they need to pull up their socks and get back to the standards they set – I am still in love with this operator. 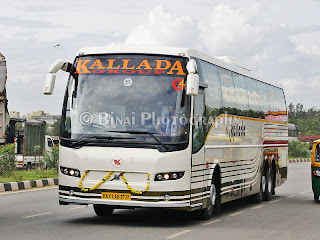 Will I take this service again: Its Kallada G4! I am in absolute love with this operator. They need to revise the timings shown on the website though. pls give me route of rameshwaram..? Bus takes 3.5-4hrs from Madurai to Rameswaram. Buses leave from Mattuthavani Bus Stn.